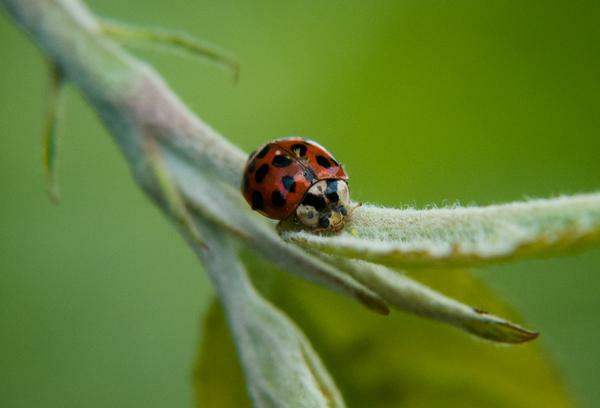 There are more than 400 different species of lady beetles (family Coccinellidae) in North America, and many of them serve as predators of aphids, lepidopteran eggs, and other soft-bodied insects in apple orchards. The sevenspotted lady beetle (Coccinella septempunctata, originally native to Europe) and convergent lady beetle (Hippodamia convergens, native to North America) are two of the more common in the Southeast. 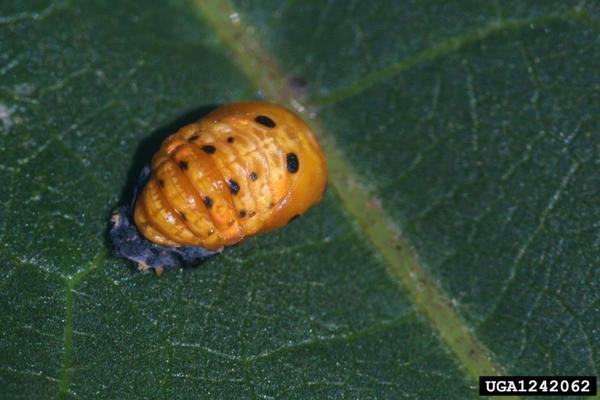 Regardless of species, most adults are brightly colored (orange or red), exhibit a variety of spot patterns (or have no spots), and are approximately 1/4 inch (6.5mm) in diameter. Larvae are often described as looking like minature alligators, and they are typically blue-black with orange markings. Eggs are yellow to orange, shaped like spindles, and usually laid in clusters. The multicolored Asian lady beetle (Harmonia axyridis) is a distinct species originally from eastern Asia, with a wide range of color shades and spot patterns, although some have no spots. A feature that is fairly reliable in differentiating it from other species is a black "W"-shaped pattern on the pronotum (above the head). 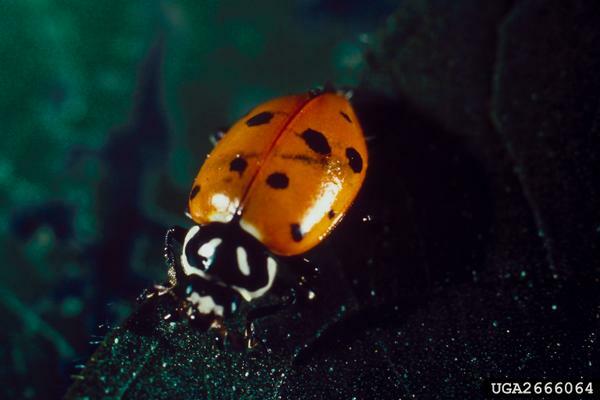 This lady beetle was deliberately imported to North America in the late 1970s to serve as a beneficial predator, but these initial releases did not appear to become established. Today's populations are more likely to be the result of accidental introductions by cargo freighters in the New Orleans area in the late 1980s. Regardless, the species is well established in the United States and has displaced native species in many areas. 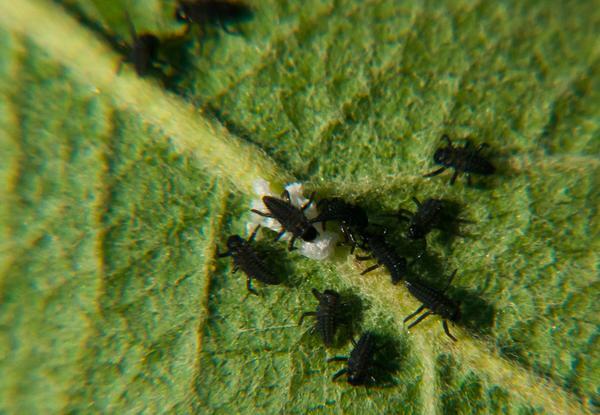 It is a very effective biological control agent for many crops, but has achieved notoriety as a nuisance pest by overwintering in large numbers in homes and other structures. Although it may be seen feeding on apple occasionally, it attacks only fruit that has already been injured by other means. 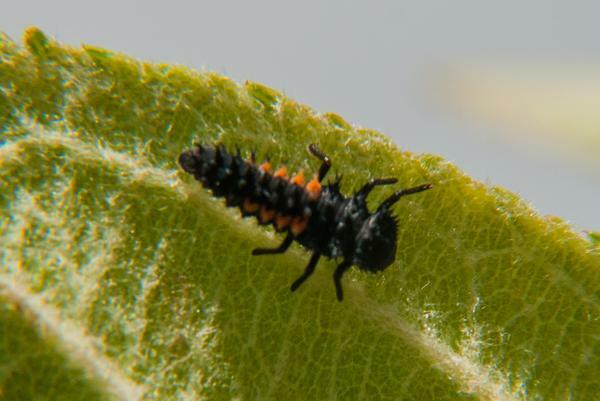 In addition, Stethorus punctum (the "spider mite destoyer" or "black lady beetle") is a species native to North America that serves as an important and common predator of mites in apple orchards. 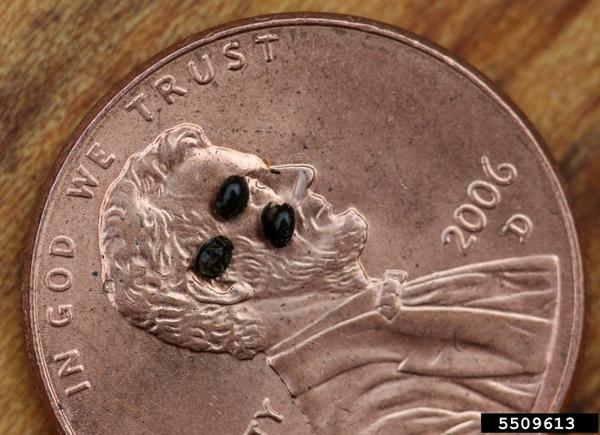 Adults are similar in shape to "regular" lady beetles, but are much smaller with a diameter of approximately 1/16 inch (1.5mm). They are solid black and shiny, with a sparse covering of fine white hairs. Pupae are black and shaped like teardrops. Young S. punctum larvae are dark gray but become redder as they mature. 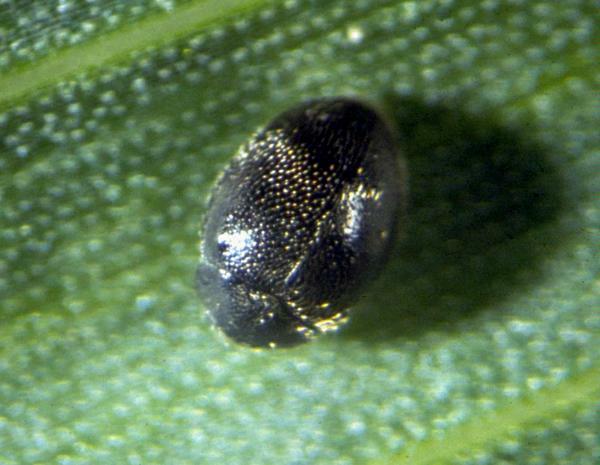 Eggs are white, 1/64-inch (0.5mm) long, oval shaped, and are usually laid on the undersides of leaves. Convergent lady beetle (Hippodamia convergens). 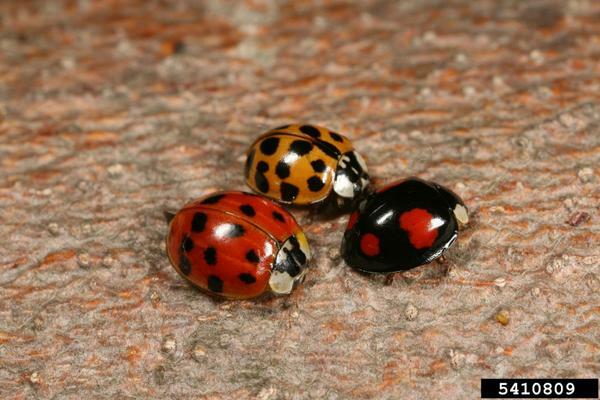 Various forms of multicolored Asian lady beetles (Harmonia axyridis). Multicolored Asian lady beetle (Harmonia axyridis). Twice-stabbed lady beetle (Chilocorus stigma). Spotted lady beetle (Coleomegilla maculata). 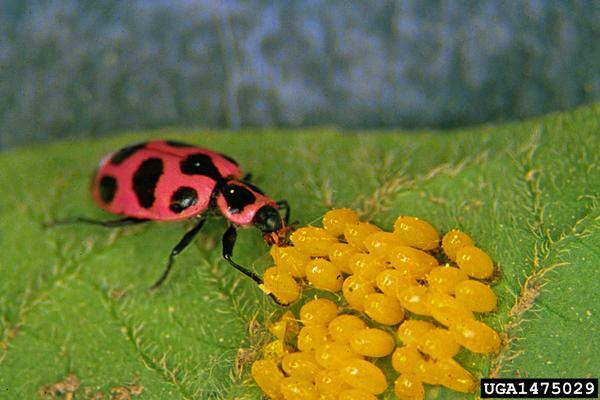 Lady beetles have different overwintering strategies, depending on the species. Some go into diapause as adults, others overwinter as larvae, and some migrate to warmer regions. In spring, females lay clusters of eggs near prey, which provides food for both the adults and hatching larvae. 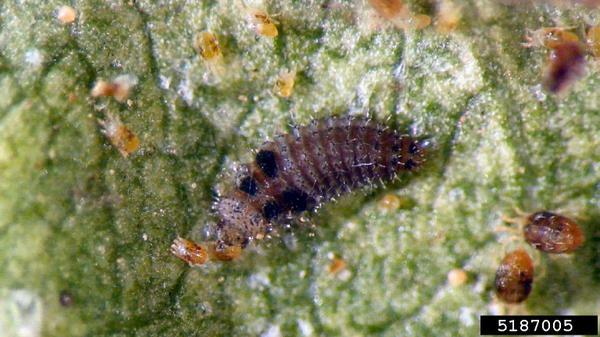 Most species pass through 4 larval instars before attaching themselves to leaves or apples and pupating. After approximately 5 to 8 days, adults will emerge and empty pupal cases often remain behind. 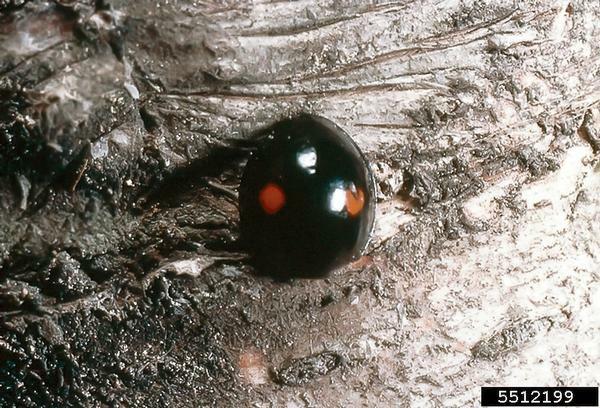 Multicolored Asian lady beetle females overwinter in protected areas (cracks in cliffs, logs, structures, etc.) and become active in spring. 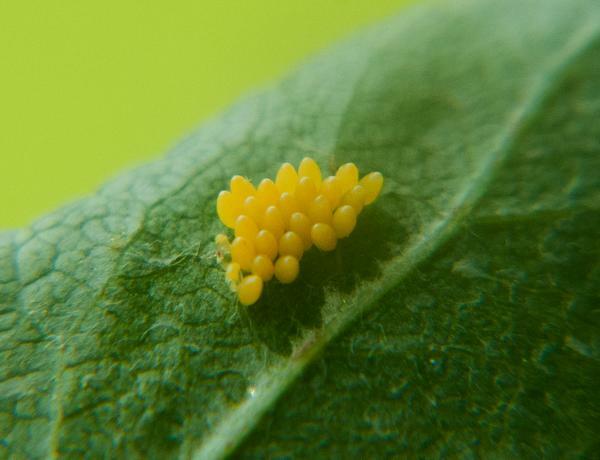 Once eggs are laid, development to adulthood can take over a month in cool conditions. 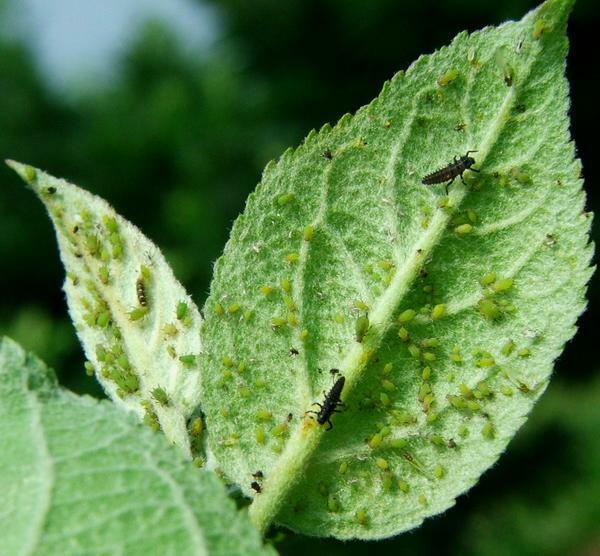 During this time each larva consumes approximately 300 aphids. Adults may live 2 to 3 years in favorable conditions. Stethorus punctum overwinter as adults in dead leaves and other organic matter either in the orchard or nearby. The spring emergence begins around the tight cluster stage and peaks from pink to bloom. Adults will lay eggs from May to mid-August, though they may remain active until late October. Larvae usually hatch within 5 days, feeding on mites for a little less than 2 weeks before entering a pupal stage for about 5 days. There are usually 2 to 3 overlapping generations per year. 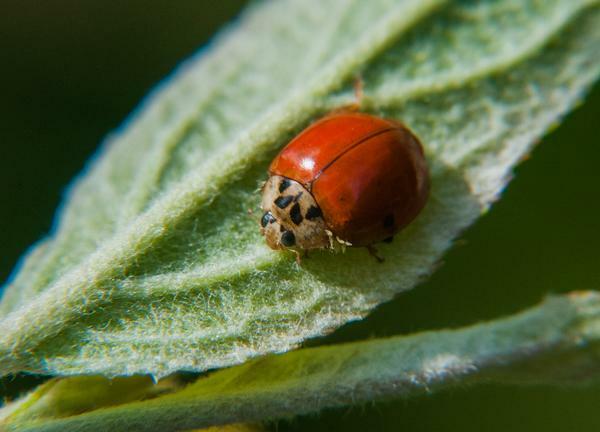 Species of the larger lady beetles feed on green apple and spirea aphids, certain other soft-bodied insects, and the eggs of moths and butterflies. 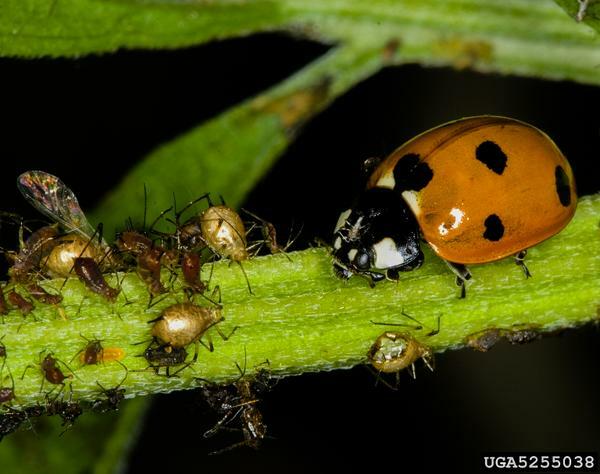 Adults and early-instar larvae are not particularly heavy feeders, but late-instar larvae can be voracious, and by the end of its life a single lady beetle will have consumed as many as 5,000 aphids. 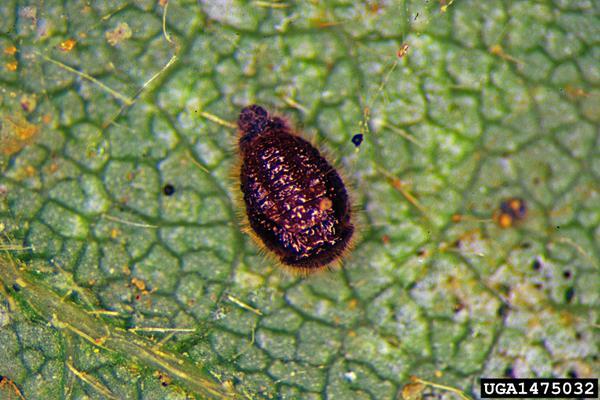 Being considerably smaller, Stethorus punctum consumes only mites; in North Carolina apple orchards, it is a significant predator of European red mites, with larvae destroying up to 75 mites per day and adults even more. 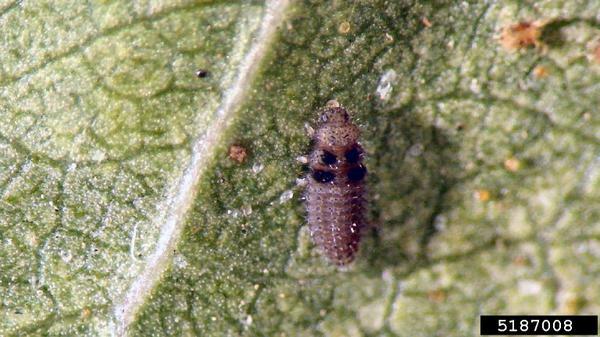 Generally, a population of 2 to 5 mites per leaf must be present in order for S. punctum to remain in an orchard. 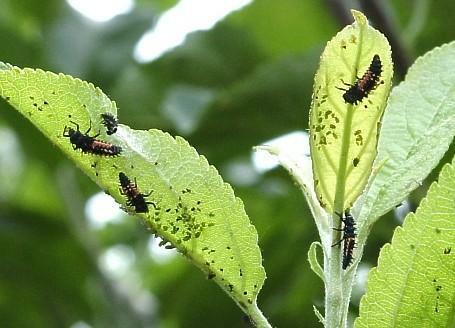 Lady beetle larvae feeding on green apple aphids. Fourteen-spotted lady beetle (Propylea quatuordecimpunctata) feeding on aphids. Stethorus spp. 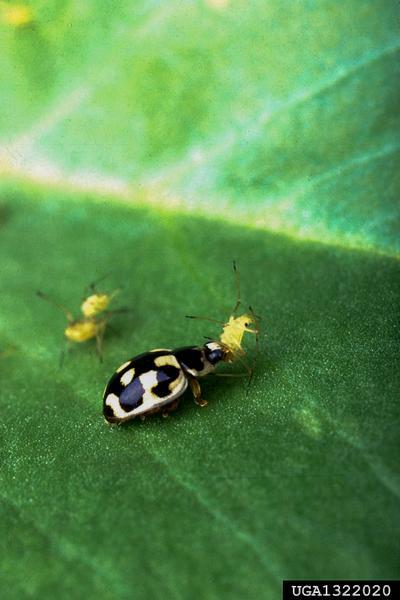 feeding on mites.